My new edited book is now in print and is available to purchase from booksellers. 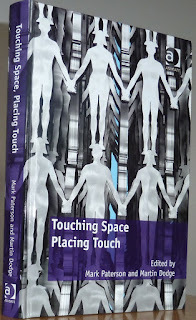 Touching Space, Placing Touch has taken quite a while to complete but the result is, I think, a worthwhile volume. Full credit to my co-editor Mark Paterson who was really responsible for guiding the intellectual development of the book and took real charge in getting it into print. We are both pleased with the end result. Its got a range of good chapters and some real thematic coherence. Thanks to all our contributors for their efforts. Credit to Ashgate as well for doing an effective and professional job with the editing, design and physical production - its a nice hardback volume. It looks good on my office shelf! While its quite expensive (£65; $120), this is very much the norm for this type of volume. We hope it will find an audience, get some good reviews and sell some copies. This promo flyer gives more details on the content of the book along with a copy of the cover blurb.